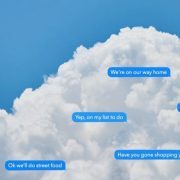 What’s Apple’s New Messages in iCloud Feature all about? One of the promised features when Apple first announced macOS 10.13 High Sierra and iOS 11, was Messages in iCloud, a way of syncing your conversations in Messages via your iCloud account. Despite the fact that Messages already tries to sync its conversations between your devices, this feature proved difficult for Apple to deliver, and it didn’t appear until the recently released macOS 10.3.5 and iOS 11.4 (What version OS are you running?). With Messages in iCloud, your conversations and their attachments in your iCloud account are stored on Apple’s iCloud servers, rather than on each of your devices individually. One advantage of this feature is it can offload non-trivial amounts of data to iCloud, freeing up more space on that 16 GB iPhone. Another advantage is conversations should also sync perfectly and more quickly than in the past, something that was often frustrating when conversations didn’t quite match up across device. (iOS 11.4 also fixes a bug that could cause some messages to appear out of order.) Even better, deleting a conversation or attachment on one of your devices deletes it from all of them. Enabling Messages in iCloud is simple. On the Mac, open Messages > Preferences > Accounts and select the Enable Messages in iCloud checkbox. In iOS, go to Settings > Your Name > iCloud, and turn on Messages. You won’t be able to enable Messages in iCloud unless you’ve enabled two-factor authentication for the Apple ID associated with your iCloud account. This is a good idea for security reasons anyway! On the Mac, in the Messages account preferences, there’s a Sync Now button you can click if, for some reason, Messages hasn’t synced automatically. We don’t yet know if or when that will be necessary. When you first enable Messages in iCloud in iOS, you may see a note at the bottom of the screen saying that uploading to iCloud requires the device to be plugged in and connected to Wi-Fi. That’s necessary only for the first big upload. Should you wish to turn off Messages in iCloud, be aware that it may take some time for each device to download all the messages. For most people, Messages in iCloud is a no-brainer. Syncing your messages works the way you’d expect, complete with quick updates and universal removal of deleted conversations. The main reason you might not want to enable the feature is if you have only the free 5 GB of iCloud storage and aren’t interested in paying for more space. https://www.noteboomtutorials.com/wp-content/uploads/2018/07/Messages-icloud-photo.jpg 391 900 Dan Wassink https://www.noteboomtutorials.com/wp-content/uploads/2014/12/nt-logo-white.png?_t=1533823527 Dan Wassink2018-07-05 09:39:202019-03-04 17:54:37What’s Apple’s New Messages in iCloud Feature all about?